On Sunday, October 28th, former mayor of New York and lawyer within the Trump administration, Rudy Giuliani, published an op-ed piece on Townhall. The piece, titled ‘Tehran Recognises Iran Opposition as the Alternative; So Should We’, lent its support to the People’s Mujahedin Organisation of Iran (MEK), and highlighted their strong standing as a viable alternative to the clerical regime in Iran. Giuliani started his piece by describing what an “honor” it was to address the Iranian opposition in the United States at a recent protest in New York. Giuliani reiterated that the international community has “an obligation to listen to what the Iranian people have been saying”. What Is the Iranian Public Saying? Over the last nine months, the Iranian people have made their feelings clear. A wave of protests has swept over Iran. People have marched in the streets across Iranian cities, many chanting anti-regime slogans like “death to Khamenei”, and “death to Rouhani”. Giuliani expressed his solidarity with the protesting Iranian public. He described himself as “one of a large bipartisan group of former governors, mayors, military leaders, senior administration officials and members of Congress, who agree on one critical foreign policy, as the Iranian people do: Iran is entitled to freedom and democracy”. 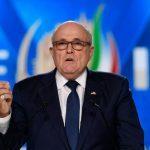 As part of his desire to bring freedom and democracy to Iran, Giuliani has strongly supported the largest and best-organized opposition group; the MEK. Giuliani explained his support in terms of organization. He said, “fundamental change in Iran requires organization, leadership, a platform, endurance, competence, and sacrifice”. In Giuliani’s eyes, the only group that possesses all of these qualities is the MEK. 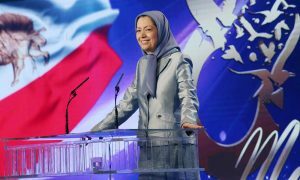 He said, “the one leader that Tehran fears the most is Mrs. Maryam Rajavi, the president-elect of the broader coalition of the National Council of Resistance of Iran (NCRI) which includes the MEK as a member”. The group’s effectiveness and the threat it poses to the regime is apparent in the regime’s attempts to attack its members. This year, two terror attacks against the group were foiled in the last stages of their execution. The second plot aimed to detonate a car bomb at the MEK’s Grand Gathering in Paris, an event Giuliani himself attended. Iranian spies have been detected operating in Belgium, France, Germany, Albania, and the United States. Each time, the object of the covert espionage activities has been the MEK and its members. Giuliani spoke about two regime agents detained in New York last year. 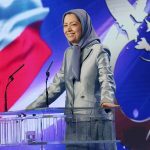 They were arrested at a rally held by the Iranian opposition with a “target package” and detailed instructions on capture and kill operations. “New York has seen enough terrorism for several lifetimes; this must not stand”, Giuliani said. “Moreover”, he continued, “we can only conclude from an operation so brash that the regime in Iran feels threatened by all that is going wrong. They consider the MEK to be an existential threat”. 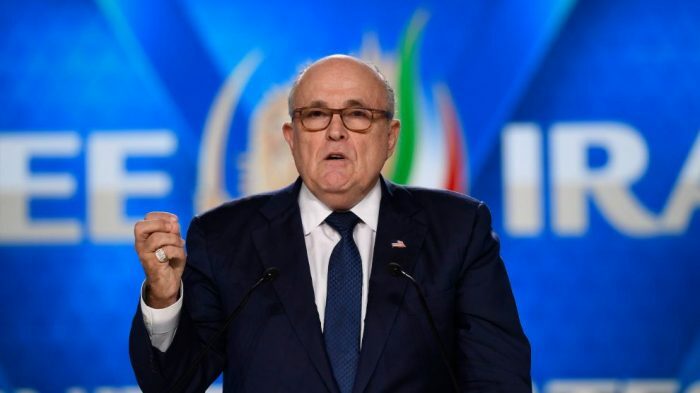 Giuliani also addressed the MEK’s detractors and critics who say that the organization is not widely supported by Iranians and does not have sufficient popularity within Iran. The former mayor of New York concluded his op-ed on an optimistic note. He predicted that the Iranian regime “will be overthrown. It is a question of when not if”. He cited the Iranian people’s determination and will to protest in the streets, coupled with economic sanctions, like those introduced by the Trump administration, as the factors that will bring about the mullahs’ downfall. “Iranians are demanding a democratic republic. Under the leadership of Maryam Rajavi and the movement of dedicated dissidents that she has established inside Iran and across the Western World, there is a strong and viable alternative that can make that happen”, Giuliani concluded. Below is the 10 Point political platform adopted by the PMOI and NCRI. 1) Ballot Box – In our view, the ballot box is the only criterion for legitimacy. Accordingly, we seek a republic in Iran based on universal suffrage. 2) Pluralism – We want a pluralist system, freedom of parties, and assembly. We respect all individual freedoms. We underscore complete freedom of expression and of the media and unconditional access by all to the Internet. 3) Death Penalty – We support and are committed to the abolition of the death penalty. 4) Religion & State – We are committed to the separation of Religion and State. In our view, any form of discrimination against the followers of any religion and denomination will be prohibited. 5) Gender Equality – We believe in complete gender equality in political, social, and economic arenas. We are also committed to equal participation of women in political leadership. Any form of discrimination against women will be abolished. They will enjoy the right to freely choose their clothing. They are free in marriage, divorce, education and employment. 6) Judicial System – We believe in the rule of law and justice. We want to set up a modern judicial system based on the principles of presumption of innocence, the right to defense, effective judicial protection and the right to be tried in a public court. We also seek the total independence of judges. The mullahs’ Sharia law will be abolished. 7) Human Rights – We are committed to the Universal Declaration of Human Rights, and international covenant and conventions, including the International Covenant on Civil and Political Rights, the Convention against Torture, and the Convention on the Elimination of all Forms of Discrimination against Women. 8) Equality – We are committed to the equality of all nationalities. We underscore the plan for the autonomy of Iranian Kurdistan, adopted by the National Council of Resistance of Iran. The language and culture of our compatriots from whatever nationality, are among our nation’s human resources and must spread and be promulgated in tomorrow’s Iran. 9) Market Economy – We recognize private property, private investment and the market economy. All Iranian people must enjoy equal opportunity in employment and in business ventures. We will protect and revitalize the environment. 9) Foreign Policy – Our foreign policy will be based on peaceful coexistence, international and regional peace and cooperation, as well as respect for the United Nations Charter. 10) Nuclear Policy – We want a non-nuclear Iran, free of weapons of mass destruction.